You’ll probably have realised by now, that I am very interested in bread making and am definitely on a mission to improve my skills. Forgive me for being evangelical, but I find it so rewarding – I love making magic! Those of you who have made bread, have probably used the quick yeast sachets or perhaps the sort that comes in a larger pot. They work, of course, but are they the best to use? On a bread course at the Bertinet Kitchen, I learnt that some dried yeast is just too fierce for some yeast baking – fresh is just perfect. The lovely Breadwinner bakery agree. The smell is gorgeous and the texture amazing. When I was baking in France, it’s what we always used. Where can I buy fresh yeast? But obtaining fresh yeast? It can be difficult to find if you’re not in a city and even then it can be a challenge. At one time, some supermarkets were willing to provide some if you asked nicely – this seems harder to obtain recently. Polish shops are also a good source, it is sold in small square blocks. Help is at hand – you can now order it online from various outlets. Once you’ve got it, store in the fridge in a plastic box, on a slightly dampened kitchen towel. Do not seal the lid, you should let it breathe. It will last around 2-3 weeks like this. I’ve tried freezing fresh yeast cut up in handy 20gr pieces and results are a little mixed. Go on, try some and let me know how you get on! L’Hirondelle (Swallow) yeast was first introduced in 1895 and is now the most used yeast in the world. 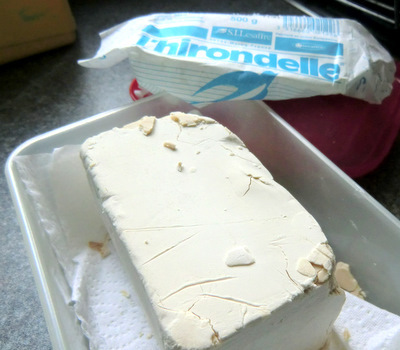 It was developed for french baking that contains no fat or sugar but works equally well with other types of baking and if you make yeast products (such as rolls) and freeze them when proved, but not cooked, it lasts particularly well in the freezer. Last updated by Bread Baker Danielle at April 25, 2017 . Very good to know. Thank you! If frozen how long can the yeast be still good? I’ve had some that was about 6 months old, but of course I cannot guarantee that! Actually, I can get fresh yeast in small domestic quantities all the time. I just go to my local Tesco supermarket and ask behind the bakery counter for a bit of their yeast. They’ll sell me enough for a couple of weeks baking for a few pennies. It used to be free, but I think people started asking for commercial quantities so the small charge was introduced. It’s good stuff today – I have a large loaf baked in my 3kg tin cooling as I type. Haven’t tried Sainsbury’s or Asda for similar deals yet, but I will.